Today's TWD is brought to you from Ashley of A Year in the Kitchen. Little Miss Ashley chose a most scrumptious looking Black and White Banana Loaf (aka chocolate Marbled Banana Bread). I am a huge banana bread lover, and was really excited to try this one out, because I have never actually had chocolate and banana together in a loaf...I know call me crazy. This was the first TWD recipe that I was actually a little disappointed with. After reading so many people's comments on how they didn't like the nutmeg taste, I knew right away that I would be omitting that from my recipe, I was too afraid to chance it. After I got my batter mixed up, I found it to be very runny, which was my first indication of an "un-marbled" loaf. The oven timer dings, I pull out my big brown loaf from the oven and am immediately happy with the smell. Now I wait to see if my marbling turned out. 20 minutes later, and the answer is...NO. I have hardly any marbling in my bread, but hey, looks can be deceiving. So, I cut a warm slice and hungrily take a big bite out of it. My reaction was...mixed...the bread was very moist, but I don't know if I really cared for the flavor. It actually seemed a little bland. So, I got to thinking. I needed a way to cover up the blandness and I knew just the thing. I pulled out my Starbucks Java Chip Ice Cream, put two whopping scoops on top of my chunked up Black and White Loaf. 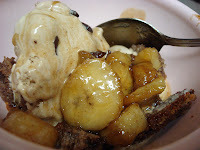 I then proceeded to amaze myself...and my tummy...and flambeed some bananas, bananas foster style!! Yeah you heard me! And now I had a Black and White Loaf that I truly adored!! 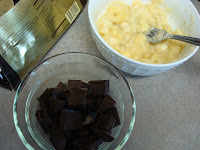 Coffee chocolate and banana! We did those same flavors! Great idea! ha ha i love it..bananas foster!!! i actually made modifications to our own taste...i didn't taste the nutmeg at all. i added cinnamon, WAY more chocolate than called for, kahlua into the chocolate. the interesting thing is that if you do chunky marbles, you DO taste the differences in the batters. SO FUN! 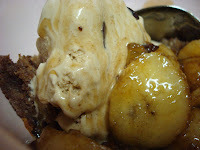 I love your creative spin on the recipe this week....ice cream and warm banana topping....yum! Nothing like a bland result to inspire something truly spectacular! Love all your extras! So glad it cam out yum in the end. Great job! 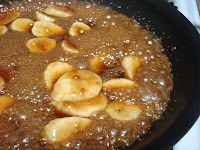 Bananas foster with coffee too? Shippable, do ya think? now that's some kinda yum! Way to dress up your banana bread! Looks delicious. LOL! Great save, amazing what a little flambé can do for a dish. 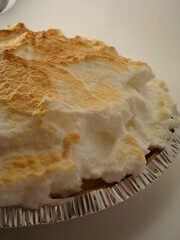 Oh, that sounds soooo good right now. Great job! haha - good job adapting your results to something you could truly enjoy! 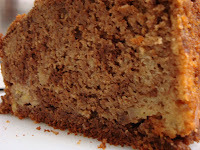 i've never had chocolate & banana in a loaf before either until i tried this recipe! I agree that this was meh. However, the caramelized bananas? Genius!